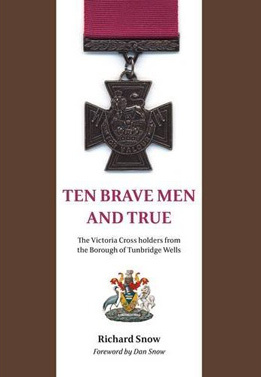 Ten Victoria Cross recipients have connections with the borough of Tunbridge Wells. Four of the VCs were awarded prior to the First World War, four for actions during the First World War, and two for actions during the Second World War. In this volume Richard Snow brings together detailed biographies of each man. Whilst available sources for information about Victoria Cross holders may generally be more comprehensive than those available for the ‘average’ soldier, Snow’s research is substantial, not only tracking down documents and photographs, but also family members and acquaintances of the men. The military career of each man is carefully presented, but his life before and after conflict – if he was one of the lucky ones to survive the action for which the award was granted – are also examined in depth. Photographs and pictures are extensive and used to good effect to supplement the men’s stories. Family anecdotes and recollections reinforce that these were ordinary men who carried out extraordinary acts, but who were very modest about their actions. Each biography also includes a short section on memorials and commemoration. The stories highlight the absolute bravery of these men and the disregard they seemed to show for their own safety. I was particularly struck by the citation for Reverend William Addison, who was awarded his VC for his actions at Sanna-i-Yat, Mesopotamia (modern day Iraq), where he repeatedly ventured into no man’s land to tend to and bring back wounded soldiers, all under withering Turkish fire. Richard Snow’s diligent research paints a good all-round picture of each man, both from his military career and his personal life. Whilst primarily of interest maybe to those with a connection to the borough, the book will nevertheless also appeal to anyone with an interest in the Victoria Cross or gallantry in general.